Reflexology is a natural healing technique that approaches the body as a whole with interrelated systems reflected in your feet. By using skillful pressure to specific points in the feet, a reflexologist can stimulate all the reflex points, supporting overall well-being and enabling your body to concentrate healing energies wherever they are needed. When your reflexologist slowly and intentionally works your feet, your whole body relaxes, allowing tension and pain to subside. 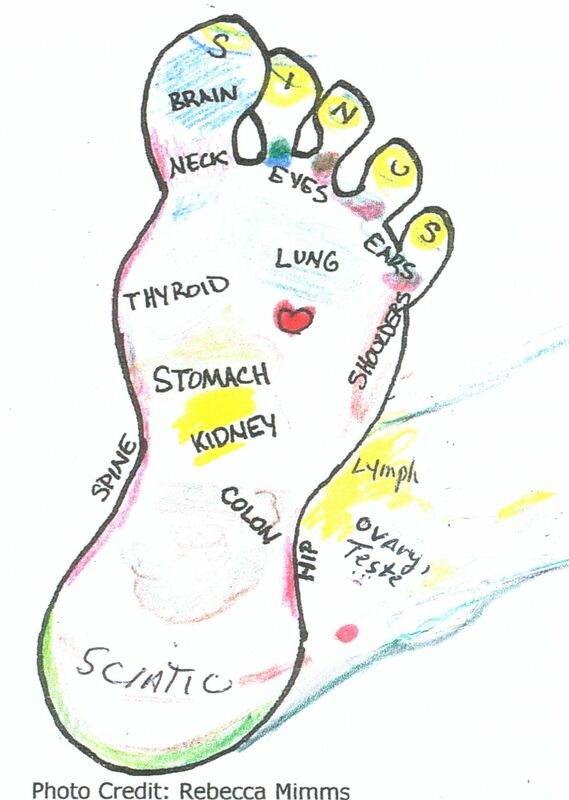 Reflexology can improve circulation, carrying oxygen and nutrients to your tissues and carrying wastes away. Improved circulation can result in decreased muscle tension and soreness, and reduced swelling from injuries or illness. Immune function, skin tone and the ability to concentrate also improve when circulation is increased. Reflexology is used as complementary care for people with a variety of conditions. It can help alleviate headaches, reduce arthritic and back pain, give support during addiction withdrawal, ease premenstrual discomforts, and reduce the symptoms of diabetes.